Slideshow: The appreciation in Porsche vehicle values continue unabated and some recent crazy sale prices underscore this issue. There is something about an open-top 911 that doesn’t have rear seats. Call it purity of purpose. And there's also the subconscious reaction most sports car enthusiasts have to any red car. It may be a primal association, but in the early 1990s, if you ordered a Porsche 911, chances were that it came in red. 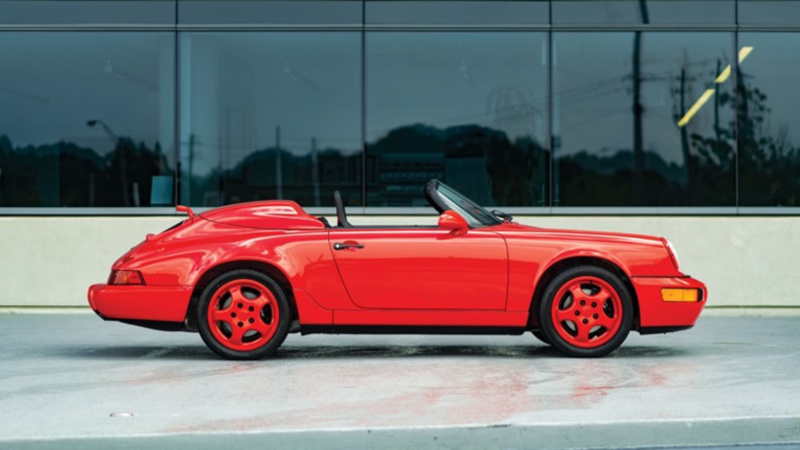 This 12,000-mile 964 Speedster is splendidly finished in Guards Red. It really makes a statement, especially with its rolling red alloy wheels, too. Porsche speedsters of the early 1990s are exceptionally rare and the car in question features a limited-slip differential and climate control, both items you’d expect on a contemporary 911, but worthwhile extras at the time. Certainly worth $250,000. For many, this remains the quintessential road racer and most desirable of all Porsche 911s. 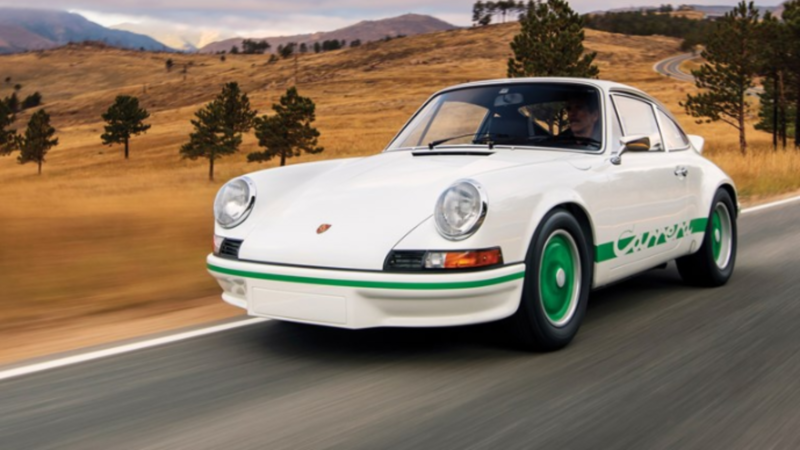 The 1973 911 Carrera RS was so popular when it was originally built, that the original allocation of 500 units sold out in less than three weeks. Although the 2.7-liter flat-six engine only makes 210hp, it doesn’t have much mass to move about, as Porsche’s racing-obsessed engineers managed to build it to a licensing weight of fewer than 2,200 pounds. An agile and enlivening driving experience which has perhaps never been equaled. It fetched $1,022,500. >>Join the conversation about these auction Porsches right here in the 6SpeedOnline Forum! Perhaps the title of the most iconic closed-wheel racing shape of all time belongs to Porsche’s 956. 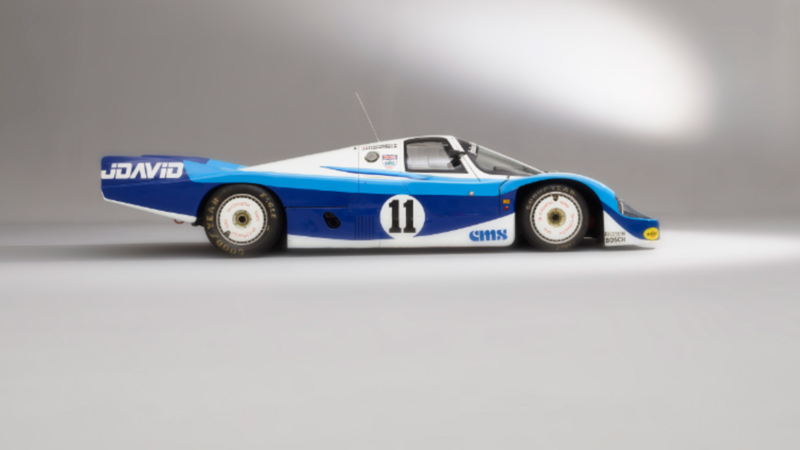 These legendary endurance racers dominated in the 1980s and are amongst the most sought-after buys for collectors today. Powered by an engine of mere a 2.65 liters in capacity, enormous turbochargers managed to generate a peak power of around 630hp. With trick aerodynamics, which rivaled F1 team cars for complexity in its racing era, the 956 was capable of 225mph on select circuits. This particular car won the 1983 Brands Hatch 1000km and Can-Am at Road America the same season. It also totaled two Le Mans entries (in 1983 and 1984), and according to astute Porschephiles, it is thought to be the most original of all privateer 956s. A bidding reserve of $5 million was set, yet strangely, nobody was keen to take the keys, which means it went unsold at last year's 70th Anniversary auction. The last of the air-cooled 911s are cherished by enthusiasts, and this particular yellow one is a true unicorn. A 993 body which was amazingly not completed into an assembled car in the late 1990s, has finally been meticulously completed by Porsche, nearly two decades later. What you have here is a 993 Turbo with 2018 build-quality, with all the air-cooled goodness that its 993 model code entails. It’s called Porsche’s ‘Project Gold’ for obvious reasons and is powered by the renowned 450 HP turbocharged 3.6-liter flat-six. A value proposition at $3,415,000? Well, that’s exactly what someone paid for it. Most traditional sportscar brands now market an SUV of sorts, but only one can claim to trace a true desert-racing heritage: Porsche. During the 1980s, whilst Porsche was struggling to mature its prototype supercar development program, which would eventually become the 959, it did something extraordinary. It entered the grueling Paris-Dakar rally raid. 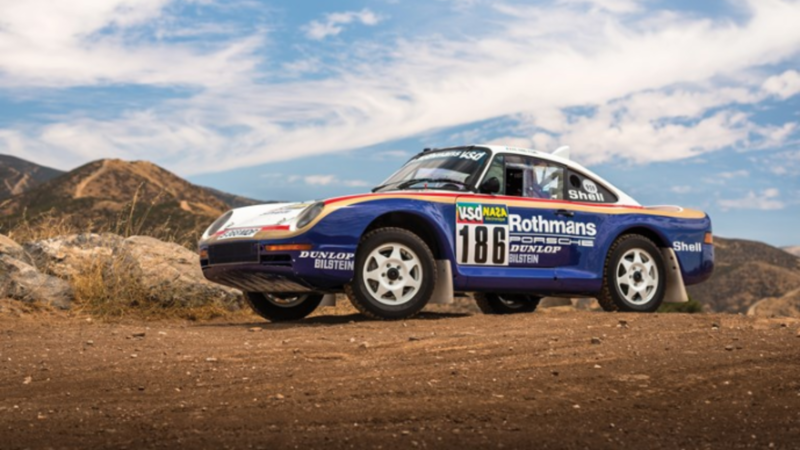 Although all three raised-body 959s which entered the 1985 Dakar failed to finish, they became legendary for the attempt, which eventually became a success the next year, as Porsche won. Like all factory facing Porsches of the period, the 959 Dakar featured Rothmans livery and interestingly, unlike the road-going 959, it wasn’t turbocharged, running a 3.2-liter naturally-aspirated flat-six instead. Final bid? An unsurprising $5,945,000.